“We are doing all we can with your help and cannot thank enough those of you who have so generously donated. This Zambezi Elephant Fund news update is inspired not only by the incredible work that is being carried out right now throughout Africa, but most especially on the ground right here in the Zambezi Valley. Read about the Zambezi Elephant Fund’s newest updates and share with friends, if you can – this will help tremendously in our bid to raise global awareness of the devastating poaching problem and, in turn, accelerate understanding and inspire action. There is a terrible forest fire. All the animals are fleeing the conflagration except for the hummingbird, which is flying back and forth, scooping up little slivers of water from a spring and dumping them on the flames. “What do you think you are doing, stupid little bird?” said the other animals derisively. Steady progress has been made towards the enhancement of living conditions for rapid reaction anti-poaching rangers based at a forward base point in Mana Pools National Park. This is an area known for heavy poaching, so it is strategically positioned for easier access and the quicker deployment of rangers. The base will make a powerful statement and will most certainly motivate the rangers in their work. Zambezi Elephant Fund thanks our partner, the Tashinga Initiative, for undertaking this critical implementation and also the British Embassy, Harare for significant funding in support of this project. A sum of $40,000 has been raised towards the total of $120, 000 needed to complete the building of the base through a phased process of implementation. Please help us raise this sum, with any amount you can. The rangers will be able to operate more efficiently and faster in a more central and supportive environment. 173 kilogrammes of ivory was (recently) seized at Harare International Airport. Three locals and one Malian national have since been arrested in connection with the case. The cargo was destined for Singapore. In 2015, four Zimbabweans, concerned for the plight of Zimbabwe’s elephant and wildlife, formed a non-commercial trust, Flying for Wildlife. The main objective of the trust is to provide Zimbabwe National Parks and Wildlife Management Authority and other stakeholders with regular, low-cost aerial surveillance and monitoring over wildlife areas and parks. Flying for Wildlife pilots have already flown National Parks officers, researchers and anti-poaching units over various areas in the Zambezi Valley; these flights have been very valuable and were made possible by kind donations of fuel, accommodation and logistics from all those involved and, of course, the goodwill of the pilots and aircraft owners. The trust is completely reliant on donations. Zambezi Elephant Fund has offered to help towards fuel (Flying for Wildlife has received clearance through the Zambezi Society to have two aircraft airborne for surveillance in the next two weeks) and we will continue to support this excellent initiative in whatever way we can – with your help! If you’d like to get involved or make a donation,please let us know. Also, please visit the Flying for Wildlife Facebook page and Like! Lower Zambezi Wildlife Support Group has also taken to the skies, monitoring the western end of Lower Zambezi Valley with support from Zambezi Elephant Fund donations, bringing heightened awareness of the situation on the ground. If you’ve never looked into the eye of an elephant, just that moment when you each hold each other’s gaze and time stands still forever, you won’t know that heart-stopping glimpse into the ancient wisdom and peace of a truly sentient being. It’s like looking into the very soul of integrity and grace. 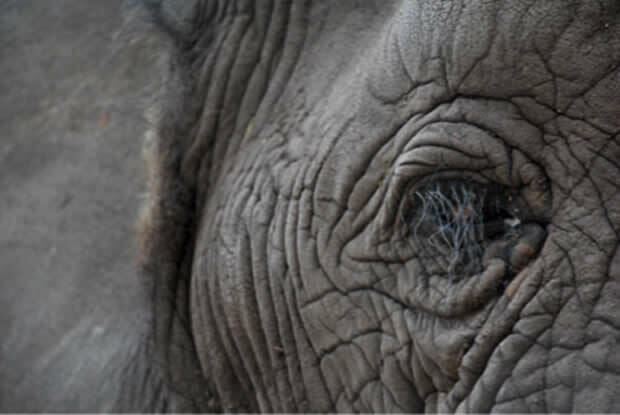 Thank you, Judy Travers of Imire for the beautiful elephant eye photograph. Newer PostTo our special safari friends – we need your help!